While our vision was born in 2007, our quest began in 2011 when we undertook our first assignment as a bottom-tier provider of contract mining services. Building on the foundation of a high performance culture, an obsession with results and distinct entrepreneurial finesse, our business has grown into a reputable player in the primary and secondary sectors with mature capabilities in contract mining, civil works and manufacturing of supplies for the mining fraternity. To be catalysts of positive change by offering services and products of highest quality and value, thus impacting our clients and the broader society in positive and enduring ways. To emerge as a story worth telling when stories of positive corporate impact in Africa are told. We strive to lead tangible change in industries and markets where we are active. Winning With the People-Valuing people, leading them with clarity and collectively owning successes. Integrity - Being true to who we are, thus saying and doing things we mean. Our efforts are guided by highly experienced entrepreneurs and professionals, Ms Motlapele Molefi and Mr Sam Molefi. 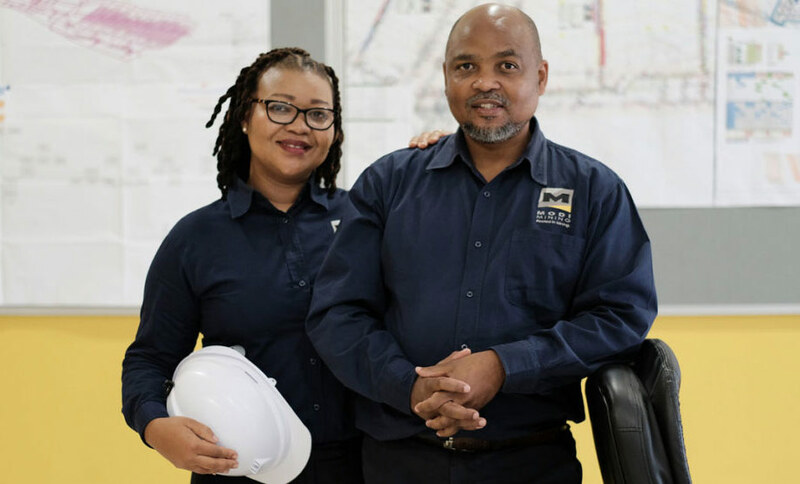 A seasoned mining engineer, Sam owes his technical and business expertise to a 20-year career in the mining and explosives industry, which features specialist and managerial roles both in South Africa and across the African continent. Motlapele brings distinct leadership and entrepreneurial prowess deriving from years of building successful enterprises through consulting and advisory.